SEOUL, Aug. 29 (Yonhap) — The top U.S. diplomat has said he did not visit North Korea as nothing would come of it even if he traveled to Pyongyang, South Korean lawmakers said Wednesday. 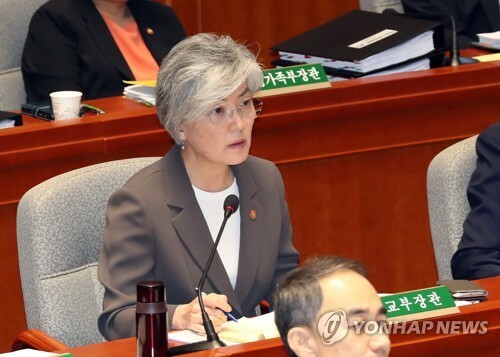 U.S. Secretary of State Mike Pompeo made the comments to South Korean Foreign Minister Kang Kyung-wha, members of the parliamentary intelligence committee said after being briefed by the National Intelligence Service, South Korea’s spy agency, at the National Assembly. Lee Eun-jae of the main opposition Liberty Korea Party, who is a member of the parliamentary intelligence committee, claimed that Pompeo sent a letter to Kang. The foreign ministry said Kang spoke with Pompeo by phone after Pompeo’s trip was called off but denied there was a letter. U.S. President Donald Trump canceled what would have been Pompeo’s fourth trip to the North, saying there hasn’t been sufficient progress in denuclearization efforts. North Korea has demanded the declaration of an end to the 1950-53 Korean War. The rival Koreas technically remain at war as the war ended with an armistice, not a peace treaty. The Trump administration, however, wants the North to submit a list of its nuclear arsenal first. The South Korean lawmakers also said South Korea sent diesel fuel to power generators in a planned inter-Korean liaison office whose construction is in the final stages. The leaders of the two Koreas agreed in an April summit to open a liaison office in the North’s border town of Kaesong to ensure active cross-border exchanges and cooperation. On Monday, a South Korean presidential official said that the cancellation of Pompeo’s trip to Pyongyang could affect the schedule of the opening of the liaison office.